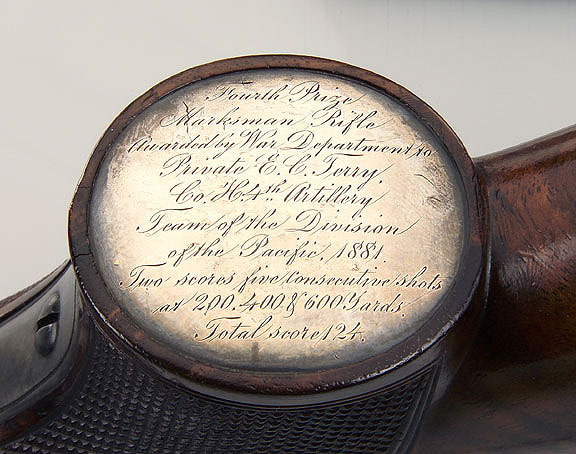 Fourth Prize Marksman Rifle Awarded by War Department to Private E.C. Terry, Co. H. 4th Artillery Team of the Division of the Pacific, 1881 Two scores five consecutive shots at 200, 400 & 600 Yards. Total score, 124. Matched Sets of Book I (Memorial Ed.) and Book II (Standard Ed.) for $110 + $7 S/H!!! (5) The 1909 Springfield Armory Catalog. The Yellow Coyote - "Dutchy"
U.S.V. Lt. F.A. Baker, 31st M.V.I.